Our clients return to their lives with a precise vision and action plan for fulfilling their destiny as luminary leaders. They are on fire, energized to create a magnificent life. Most consultants focus on improving your performance or efficiency. Our program leads you to your inner source of magnetic power, purpose, and focus - your True Self. This direct connection changes you at the fundamental level, removing the core conditioning that has prevented you from fulfilling your highest potential. As you awaken your soul, your leadership presence becomes imbued with new powers that have not yet been tapped. 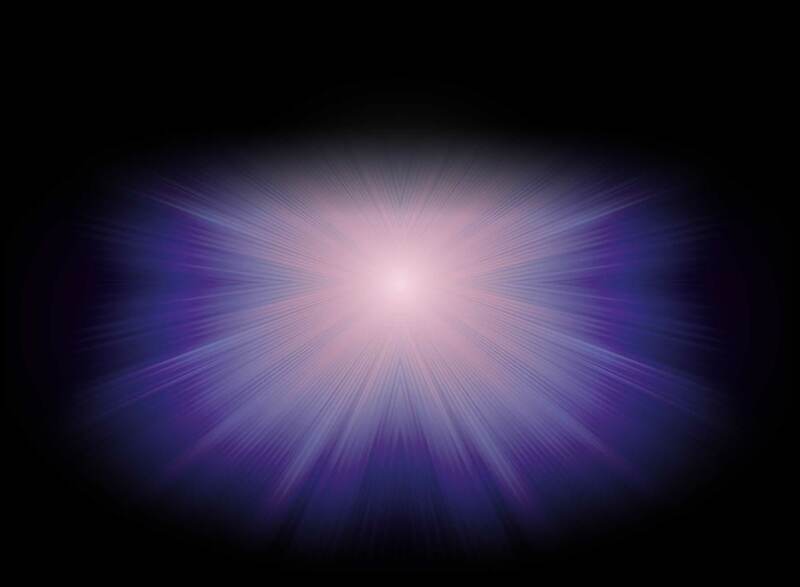 Our multidimensional approach resolves problems at the core – at the level of the True Self. It is a comprehensive method for achieving major life shifts in career, relationships, physical health conditions, or spiritual or psychological crises. The problem may be showing up in your business or your relationships. You may feel stuck, exhausted, or unfulfilled, even with the outer appearance of success. Our personalized program resolves major life shifts in three to nine months. The CPR is offered as weekly sessions by phone or in person, plus at least one full-weekend intensive with the Founders. If you’re in the midst of a personal or professional crisis, we provide pragmatic, therapeutic interventions that rapidly return you to an awakened state of clarity. A crisis usually stimulates habitual ego reactions. Our methodology connects you directly to the compassionate wisdom and power of your True Self, which is the most dependable source of resolution for any problem. Sessions are offered by phone or in person with one or both LLI founders, as needed, until the crisis is fully resolved. If you’re ready for mastery as a Luminary Leader in your world, our customized initiatory program will accelerate your learning and evolution. The comprehensive process supports you in fully embodying your soul-powered life. 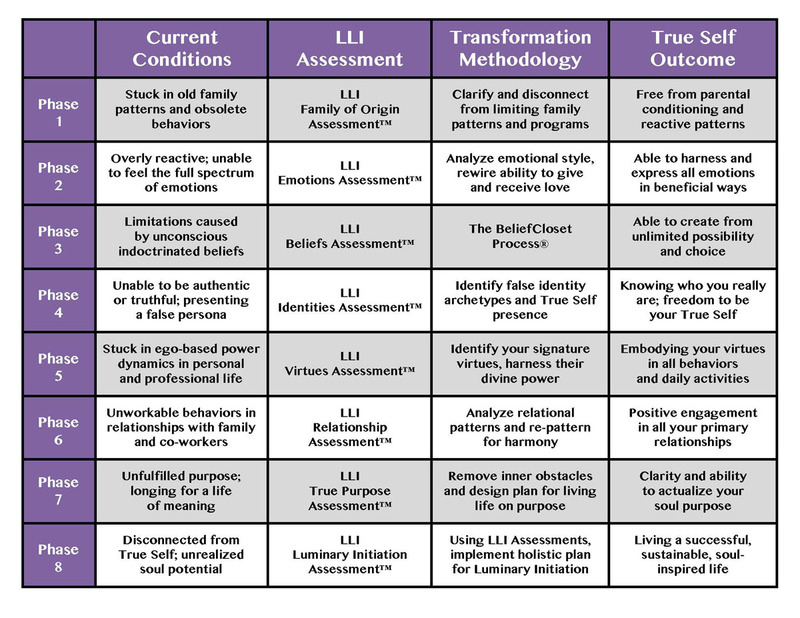 Using a series of proprietary assessments (see chart), we review your past conditioning, clarifying patterns and obstructions that have prevented you from fulfilling your destiny. Through our in-depth process of clearing old beliefs and false identities, your True Self emerges, and your life changes course toward profound fulfillment. We ensure that you integrate your new skills and awakened powers successfully into all aspects of your life – marriage and family, business relationships, health and lifestyle, and financial and career success. The Initiation includes two sessions per month with each founder, at least one private weekend retreat, and one week-long intensive during the year. The program includes work with your spouse and/or business partners. Minimum commitment: one year. We create customized retreats for individuals, couples, families, or teams, focused on solving crises, accomplishing high-performance projects, or enhancing alignment of vision and purpose. We offer a program on love and relationships, focused on how your early childhood bonding pattern with each parent impacts your adult relationships. It clarifies why you have relationship challenges in both personal and business relationships. We identify specific methods for rewiring your early neurological programming so you can create secure and healthy relationships. Our book, “Confused About Love? A Handbook for High Achievers,” is in preparation. Listen to a free recording, watch a video, and take our free assessment, the LoveStyle Profile Quiz, by clicking here. For more information about any of our programs, or for our free assessment, contact us. Click to view the Program Chart.